The Mercedes-Benz A-Class is coming to the U.S. for the first time this year, albeit without the option for a hatchback or manual transmission like it’ll have elsewhere. But with its arrival comes a new entry-level model, so, beginning this year, the cheapest new Mercedes on American lots starts at $32,500. Mercedes announced the pricing on Tuesday, saying the sedan would be on U.S. lots by “early 2019” and that the the $32,500 tag is for the front-wheel-drive A220 model, while the all-wheel drive A220 4Matic model will start at $34,500. That makes it nearly $10,000 cheaper than the next step for a Mercedes “sedan” in the U.S. market, which is the C-Class with a $41,400 base price. The A-Class is just a barely cheaper than the next biggest Mercedes four-door, though. The 2019 CLA 250, a sedan Mercedes annoyingly refers to as a “coupe,” starts at $33,100. 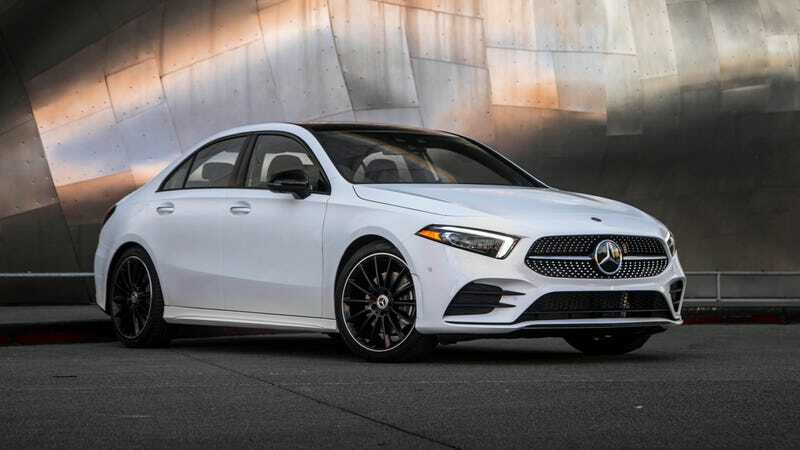 Both 2019 A-Class models will get the same turbocharged, inline four-cylinder engine, which Mercedes rates at 188 horsepower and 221 lb-ft of torque, and a seven-speed dual-clutch transmission. 17-inch wheels come standard. It’s a Mercedes, basically, with all of the fancy vibes and a lower base price. The A-Class will also get Mercedes’ new, ultra-long MBUX infotainment system, which stretches from the typical, central position of a screen between the front passengers and into the gauge panel. The new infotainment system has speech recognition, a touchscreen, a touchpad, and artificial intelligence to “learn your habits over time and automatically adapt to changes in patterns of behavior,” according to Mercedes. It’s in multiple models now, but pictured to the left in the A-Class. The A-Class, while new in the U.S., has been around in European markets since 1997 as an entry model for Mercedes’ car lineup, which includes models like the A-, B-, C-, E- and S-Class globally but has long skipped the A- and the B-Class in America. The U.S. lineup now goes from A- to C-, and skips some steps in A-Class options that will be available elsewhere: Other markets, including Canada, will get a hatchback option, and the European market can get an A200 with a six-speed manual transmission. Regardless, though, there’s a new entry-level Mercedes sedan on our shores. It will be interesting to see how this compares to the similarly inexpensive CLA-Class, and who ends up buying which of the two “ bargain” Benzes.